Keeping Bugs out of Britain's Homes • 01760 441423 to order by phone or asking us questions between 8.30am to 5.30pm Monday to Friday • or Email us at any time on [email protected] ALL PRICES INCLUDE VAT AND FREE DELIVERY FOR THE UK MAINLAND EXCLUDING HIGHLANDS, ISLANDS AND NORTHERN IRELAND FOR LARGER ITEMS ONLY. IF YOU LIVE OUTSIDE THE UK CONTACT US FOR A QUOTE. What is it? This is our premium magnetic flyscreen and insect screen patio door. You can adjust this for width and height. Fits doorways up to 2.0 metres. 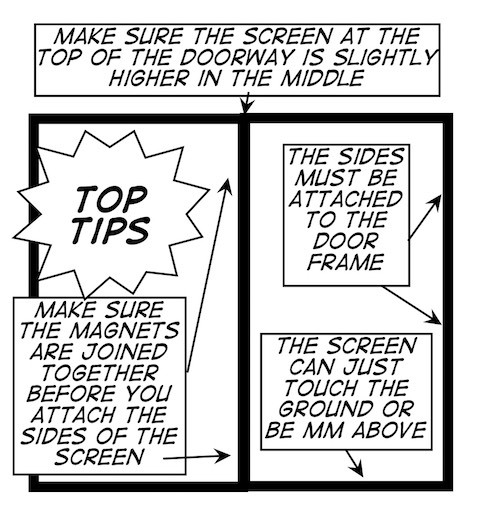 Please see instructions for how to adjust this flyscreen. Simply walk through and the magnets immediately and silently join together to keep flies, wasps and other insects out. Sizes and Colours? Available in White, it is 200cm wide x 210cm high, but can easily be adjusted for smaller doorways. Basic: Screen with hook and loop tape. This is for someone who wants to adapt a screen to a particular use and does not need or want the magnetic side profiles. Intermediate Screen with magnetic side profiles and hook & loop tape. Complete. Screen with magnetic side profiles and hook & loop tape, top rod and screws. Everything required for a professional and neat finish and for some the added security of a 2m top rod, if there are boitserous pets or children. Easy to Use? Yes you simply walk through the doorway and the magnets mean that it automatically shuts behind you. What you Get Basic (left picture): One screen, self adhesive hook and loop tape (6m+). Intermediate (centre picture): One screen, self adhesive hook and loop tape (6m+), magnetic side profiles. 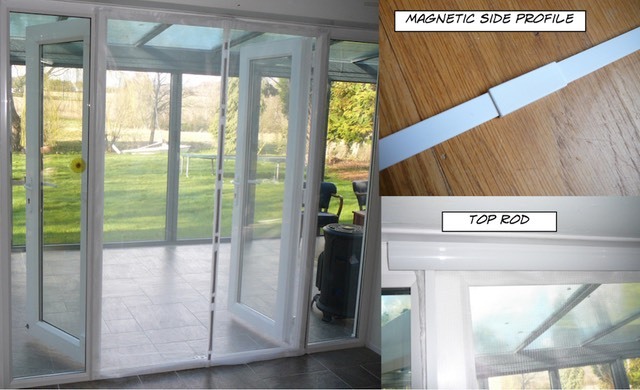 Complete Top Rod (right picture): Secure your screen with a 2m long flat top rod which you can screw or hook and loop tape above the doorway and can be cut to any required width. There is a dowel at the back that traps the material. Ideal if you need to shorten the height of your screen. Also more secure if there are boisterous pets or children. The Rod is 4cm wide and 1cm deep. Suitable for? Domestic applications. Brilliant with kids who have no concept of shutting any sort of door behind them. Also great for pets too who don’t have to worry about handles and locks either. Great for internal doors but we would not recommend that it is fitted to external door frames unless firmly secured with battens. Please note that the self adhesive hook and loop tape may not work as effectively in very hot conditions or countries. How are they Posted? : These are sent by a tracked courier service and take 3 to 5 working days. If you want next working day delivery please click on the button below. Buyers in Northern Ireland, Channel Islands, Isle of Wight, Scottish Highlands and Islands, there will be an extra charge when supplied with the top rod. Eire will be more. See Postcode listing on the Delivery Information Page but if in doubt and if you live in any of these areas, Europe or the Rest of the World please contact us for a delivery quote. If you want guaranteed next working day (Tues-Fri) delivery on all items please click the drop down menu and pay £10. You must however, place your order before 12 noon the day before you want the item. No Saturday Delivery unless you contact us first.